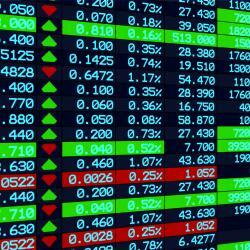 KKR Financial Holdings LLC (NYSE: KFN) shares moved up 26.88% to $11.99. The volume of KKR Financial Holdings shares traded was 4712% higher than normal. KKR Financial agreed to be acquired by KKR & Co (NYSE: KKR) for $2.6 billion. Rick's Cabaret International (NASDAQ: RICK) shares rose 13.49% to $12.20. The volume of Rick's Cabaret shares traded was 1014% higher than normal. Rick's Cabaret reported better-than-expected fourth-quarter earnings. iRobot (NASDAQ: IRBT) shares climbed 18.47% to $37.08. The volume of iRobot shares traded was 837% higher than normal. Raymond James upgraded iRobot from Market Perform to Strong Buy. Herbalife (NYSE: HLF) surged 1.26% to $75.77. The volume of Herbalife shares traded was 285% higher than normal. DA Davidson maintained Herbalife with a Buy rating and lifted the price target from $92.00 to $115.00.